I was hunting for helpful resources on Pinterest and I found one I really like which led me to an amazing teaching blog, Mrs. D’s Corner! Stephani DeLussey (Mrs. D) created this blog to “inspire teachers to make learning fun and easy by providing tried and true lessons and activities” according to her meet the teacher page. Stephani is an elementary life skills teacher from Texas who posts so many helpful resources! I could spend hours on her blog reading all the posts because they are so interesting, well organized, and helpful. 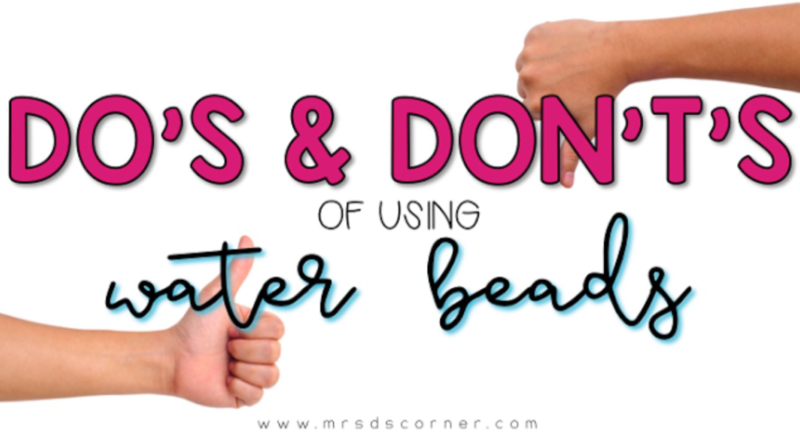 The first post I saw on her page really stood out to me, it was “Do’s and Don’ts of Water Beads in a SPED Classroom”. I just discovered water beads this summer and my first thought was that they would be great resource for SPED. Her post reassured my thoughts and gave lots of helpful advice on how to use them. Stephani said that they are a good sensory integration tool and she also provided activities that are centered around using them. She also gave really good advice about what not to do with them like do not freeze them and that they will start to stink after a while. Another post that stood out to me was about glue sponges. I had never heard of these before and so I was really interested to see what these were all about. The post was called “Glue Sponges in the Special Education Classroom” Stephani said that she uses these instead of glue sticks. In her post there was a step by step tutorial on how to make them that was very detailed. It was followed by helpful tips to make the process go smoother. I am really intrigued by these glue sponges now and I can’t wait to try them out on my own, they seem like they would work a lot better than glue sticks especially in a special education classroom. I really enjoyed Stephani’s blog Mrs. D’s Corner, it is such a wonderful resource for special educators, and educators in general! I definitely plan on returning to this blog periodically to learn more helpful tips about being a special educator!